Williamina Paton Stevens Fleming was born on May 15, 1857 in Dundee, Scotland to Robert Stevens and Mary Walker. Her father was made gilded picture frames and furniture and died when she was seven. "Mina", as she was called, attended public schools in Dundee and did well in school, advancing to become a student teacher when she was 14. In 1877, she married James Orr Fleming and they emigrated to Boston, Massachusetts. Fleming abandoned his pregnant bride and when she looked for domestic work she was hired by Edward C. Pickering, the head of the Harvard Observatory to clean his home. In 1880, Pickering was working on a project to classify stars based on their spectra and became upset with the low quality work produced by the young man he hired to do the work. Legend is that Pickering declared that his Scottish maid could do a better job and when she was given the chance she excelled. Fleming had the ability to separate stellar spectra based on their characteristics and do the calculations necessary to determine a star's position. She was made a permanent employee of the observatory in 1881 and was put in charge of the star project in 1886. She and Pickering devised a system to classify stars based on their spectra and published in 1890. When Pickering wanted to make larger catalog of stars he put Fleming in charge of the group of women he hired to do the calculations. In addition to her work on stellar catalogs, Fleming also was the first to identify that variable stars, stars whose light intensity brightened and dimmed regularly over time, could be identified by bright lines in their spectra. In 1907 she published a list of 222 variable stars, many of which she discovered. During her work she discovered 59 gaseous nebula, over 310 variable stars, and 10 novae. 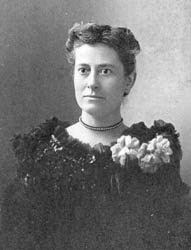 At the time, Fleming was the foremost women astronomer in America. In 1906, she became the first American woman (and the sixth woman overall) to be made a honorary member of the Royal Astronomical Society. Other honors she received include the Guadalupe Almendaro medal, given by the Astronomical Society of Mexico, for the discovery of new stars and she was made an honorary fellow in astronomy by Wellesly College. She also has a crater on the moon jointly named for her and Alexander Fleming. She died of pneumonia on May 21, 1911 at the age of 54.